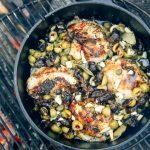 Sweet, savory, crispy and saucy, this Dutch oven recipe for Chicken Marbella delivers a “gourmet” campfire experience but without any of the work. What separates a good camp meal from a great one? We’ve all had our share of middle-of-the-road meals while camping: perfectly adequate at the time, but entirely forgettable in hindsight. But we’ve also had a handful of dinners that have completely knocked our socks off. So, what’s the difference? The truth is nobody cares how good dinner tastes if it takes three hours to prepare. It simply can’t live up to expectations. 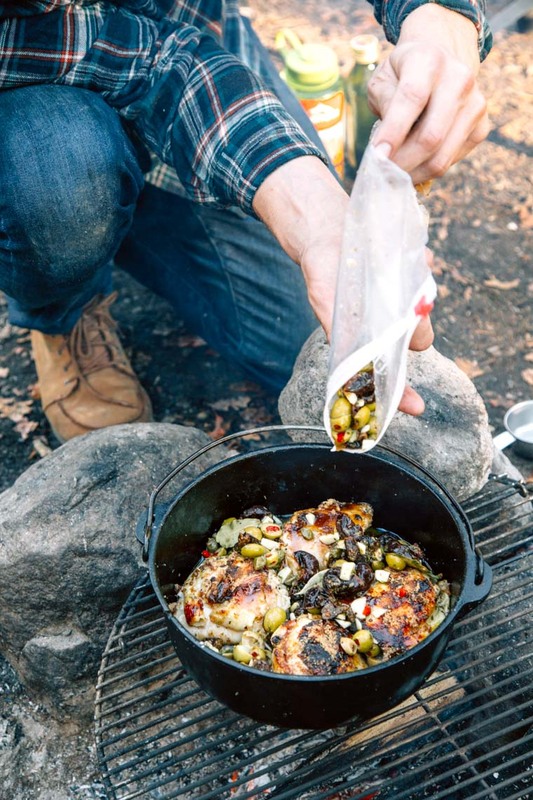 A great meal in the outdoors, therefore, delivers big “production value” with a minimal amount of time and effort. And that is exactly what this one-pot dish does. It’s called Chicken Marbella and the recipe originally appeared in the Silver Palate Cookbook in 1983. 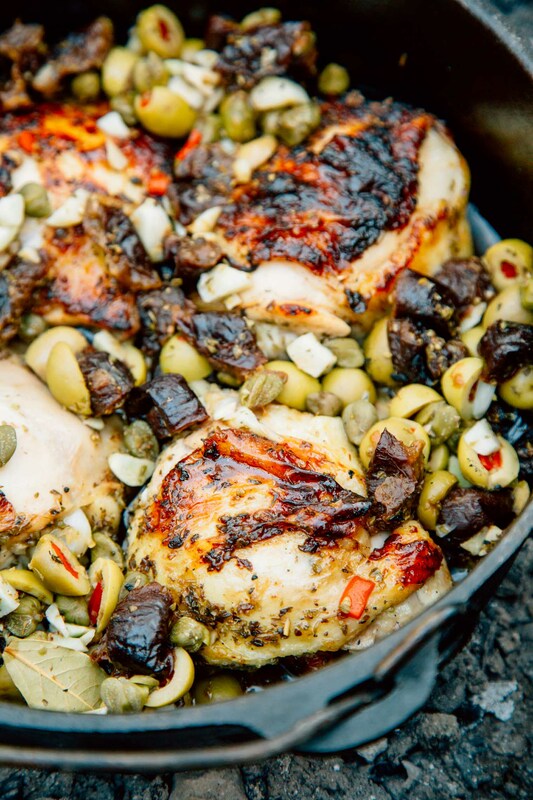 This Mediterranean themed baked chicken dish uses chopped prunes and olives to produce a sweet and savory combination that’s absolutely irresistible. However, every version calls for a piece of equipment unavailable to most campers: an oven. So after a bit of tinkering, we came up with a way to make it in a Dutch oven. What makes this meal so extraordinary is how easy it is to prepare. The only secret ingredient is foresight. At home, combine the ingredients in a large freezer bag and then toss it in your cooler. Not only does this cut down on the supplies you need to bring, but it lets the flavors marinate and build. To get the skin crispy, the original recipe calls for you to bake the chicken. But that type of dry heat isn’t really possible in a Dutch oven, so instead, you’re going to brown the skin with a little oil. Then you’ll add the marinade into the pot, which won’t cover the chicken entirely but be just enough to braise it. The result is a crispy-skinned chicken dish with a super-flavorful sauce that takes less than 45 minutes to cook. 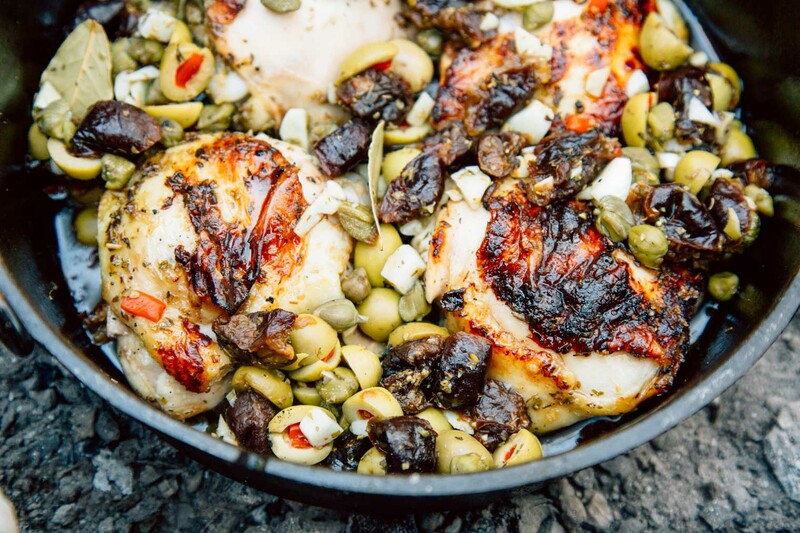 Serve with couscous, and you have the makings of campfire meal worth remembering! ‣ Big gourmet flavors from an easy-to-make one pot meal. ‣ Aside from browning the skin, there is practically no active cooking time. ‣ No onsite prep work. This marinade can and should be made ahead of time. ‣ Could be made with any type of dark meat, but we suggest thighs: bone in, skin on. 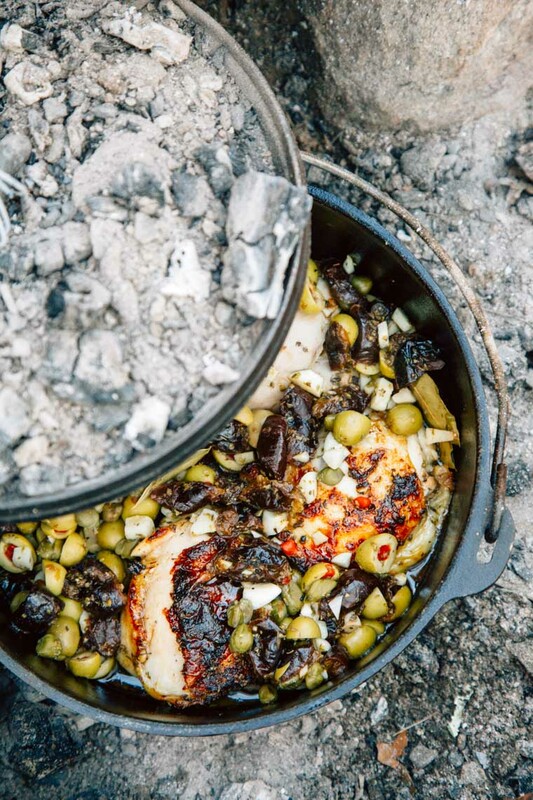 ‣ It’s OK for the chicken to be crowded in the Dutch Oven, just don’t submerge any pieces. You’re going for braised, not boiled chicken. 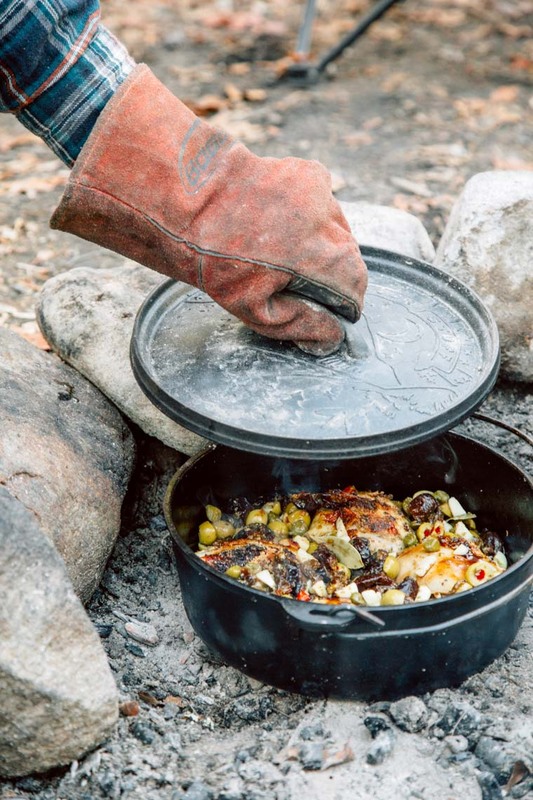 ‣ You’re looking to heat your Dutch oven to about 425° F. For a 4 qt (10 inch) Dutch oven, you will need to use 18 coals on top and 9 coals on the bottom. If you’re using wood embers from your campfire, you’ll have to approximate. ‣ It might seem superfluous, but using white wine in the marinade is essential. We tried a version without it and it was definitely missed. Pack the rest of the bottle along in the cooler and enjoy it with dinner! MARINATE THE CHICKEN: Place all ingredients except for the oil and brown sugar in a freezer bag to marinate. Place in your ice chest for at least 6 hours and up to 48 hours. PREP YOUR CAMPFIRE: Prepare 27 coals. You can use wood embers if you must, but you’ll have to guestimate the proper heat ratio (you’re aiming for 425F). Once all the coals are ready, knock them into a flat pile and place dutch oven on top of all of them. This will produce the high heat required for browning. 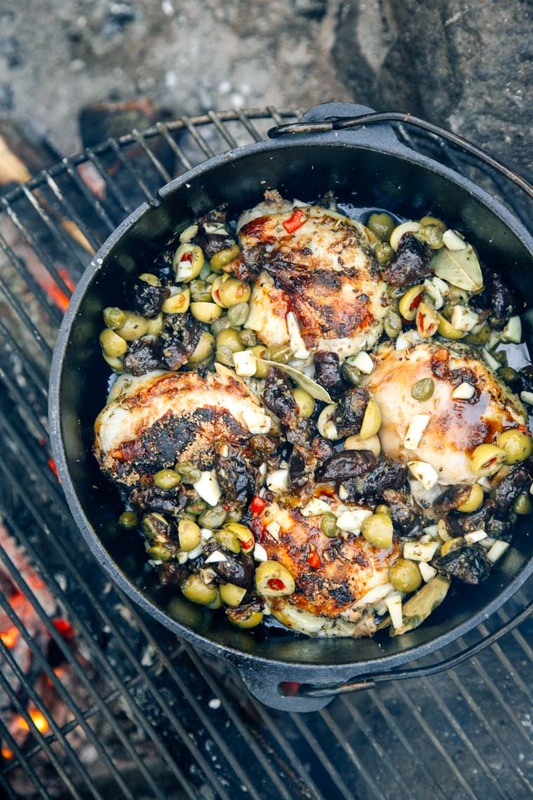 BROWN THE CHICKEN: Heat 1 tablespoon of oil in the Dutch oven. The oil is hot and ready when a drop of water instantly sizzles when it hits the pan. Remove the chicken from the marinade, and dust 1 teaspoon brown sugar over the skin side of each thigh. Brown the thighs skin side down over high heat until the skin is crispy and deep golden brown, about 6-8 minutes. Flip to brown the other side, 2 minutes. BAKE: Remove Dutch oven from heat. Add the marinade (liquid, prunes, olive, capers and all!) to the dutch oven and cover. Evenly distribute 18 coals on the lid and set the Dutch oven on a bed of 9 coals. Bake for 30 minutes, until the thighs are cooked through and their juices run clear when pierced with a knife. SERVE & ENJOY: Serve over couscous, rice, or pilaf with some of the sauce spooned over the top. This was fantastic! Super easy! Packed full of flavor – chicken fell off the bone. I did omit the tsp of salt and the brown sugar. Served over brown rice and quinoa (Costco packets). This one is a keeper and will be a camping favorite! Thank you and plan to see what other gems you may have on here. If it works, it works. Glad to hear you enjoyed it!